The new Fed chair came out in strong support of working families and the unemployed in her foundational speech this week. Good news! 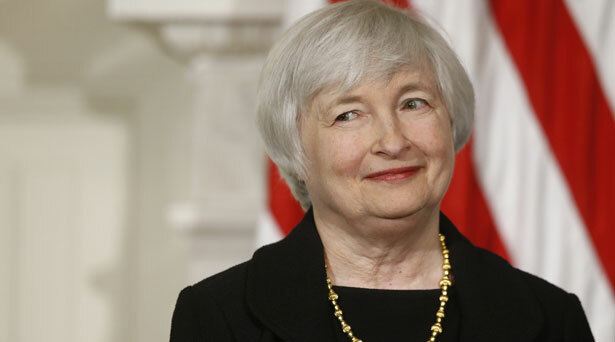 Janet Yellen, the new chair of the Federal Reserve, speaks English. This is most irregular, even unprecedented in modern times. I’ve been following Fed pronouncements for more than thirty years and cannot remember a time when Volcker-Greenspan-Bernanke ever departed from the dry-as-dust abstractions of monetary economics. Some called it double-talk. But these Fed chairmen were really only talking to a very narrow audience of bankers, financiers and learned economists. The rest of America either wasn’t listening or was unable to translate Fedspeak. Yellen broke the mold this week with her very first speech to a public audience in Chicago, a national conference on community reinvestment. She talked about the people who don’t have jobs and with a rare sense of human empathy. She even named several whom she had talked with. Dorine Poole lost her job processing medial insurance claims when the recession hit. Jermaine Brownlee, an apprentice plumber and skilled construction worker, had to scramble for odd jobs with lower pay. Vicki Lira lost the full-time job she had for twenty years when the printing plant closed, then she lost another job processing mortgages when the housing market crashed. The Fed chair (the title Yellen prefers to chairwoman) declared her solidarity with these “brave men and women.” She explicitly promised the central bank would not abandon their cause, though the economy is again attempting a sputtering recovery. This is a foundational speech for Yellen’s tenure and she will doubtless get brickbats from the usual conservative bean counters. She deserves to get far more energetic support from other political quarters, including the White House. Of course she was trying to show that, despite its austere reputation, the Federal Reserve does have a heart. But, more to the point, she asserted explicitly that Fed policy will continue to support economic growth with low interest rates intended to encourage job creation. “The recovery still feels like a recession to many Americans and it also looks that way in some economic statistics,” she warned. Her declaration is especially impressive because she did not “dumb down” the economic argument for people who are not versed in the indicators. Yellen walked though the evidence that demonstrates why the economy remains feeble—too slack to generate either vigorous job creation or rising wages. Clarity of expression was never one of the Fed’s strong traits. Indeed, Fed officials often seemed to enjoy befuddling members of Congress, most of whom are no more sophisticated than their constituents. I do not doubt her sincerity, but I expect Yellen to be tested on this commitment. The Federal Reserve’s efforts to stimulate or provoke stronger growth have not succeeded to date and deflationary forces are still present worldwide. At some point rather soon, progressive forces should start asking Yellen what else the Fed can do and demand some answers. As I have been writing for the last few years, the central bank has great untapped lending powers that could cooperate in supporting new job-creating programs like infrastructure spending—if the president and White House take the lead. Yellen, so far as I know, has never expressed herself on this possibility nor has Barack Obama. But if the misery and loss continue to tear up the lives of millions of families, as Yellen described, then the people deserve a straight answer from her and the president. To make such a deal, the Federal Reserve will need political cover to protect it from right-wing howlers. The President can provide this leadership if he has the nerve. Maybe the gutsy new Fed chair can encourage him to explore possibilities with her.